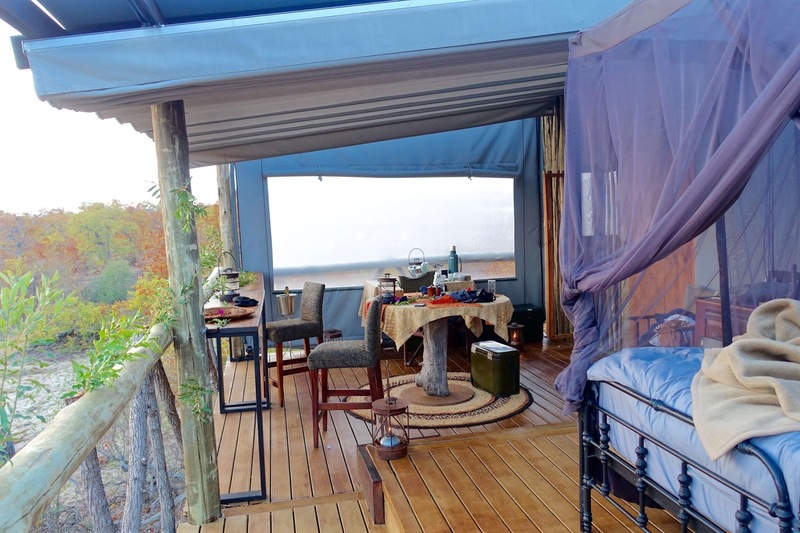 Imagine waking up high in the elevation of a tree, in the middle of the African bush, watching the sun rise over the horizon and seeing the wildlife coming to life right before your eyes, only meters away? That would be pretty spectacular huh? Well thats exactly what I was lucky enough to experience with our once-in-a-lifetime treehouse experience at the "Giraffes Nest". 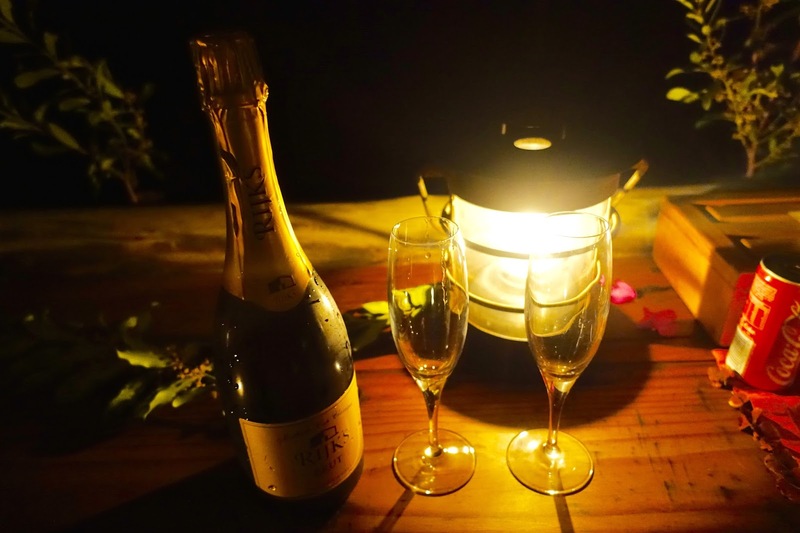 Its the Motswari Private Game Reserve's very own sleep out experience where you spend a night under the star, nestled amongst the wildlife. A few weeks ago, I embarked on the trip of a lifetime to South Africa with Alex and his parents. Predominately for his cousins wedding at the start of the trip in Johannesburg, of course we decided to extend into a two week trip with some safari experiences through in, so we travelled into the Mpumalanga area, which embraces the southern half of Kruger National Park. 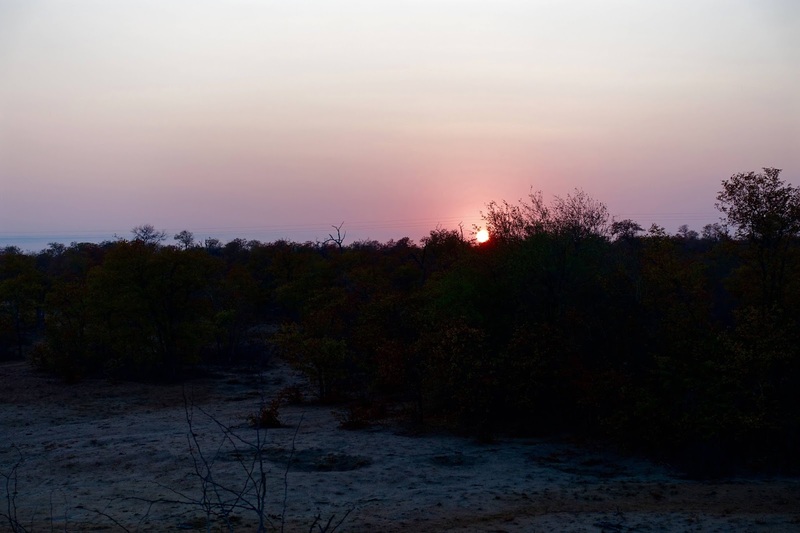 As I'm sure some of you will know, Kruger National Park is a huge nature reserve with abundant wildlife including big game, in particular the "Big Five" - Elephants, Buffalo, Leopards, Rhino and Lions. 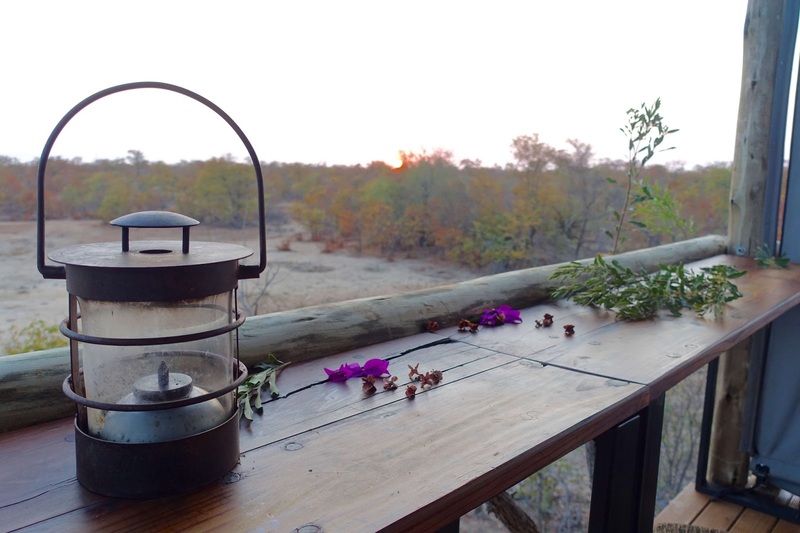 After Johannesburg, our second stop was just outside the Kruger National Park at the Paul Kruger Gate staying only moments away at the brilliant Hotel Protea Kruger Gate - there is more about my stay at this hotel to come! 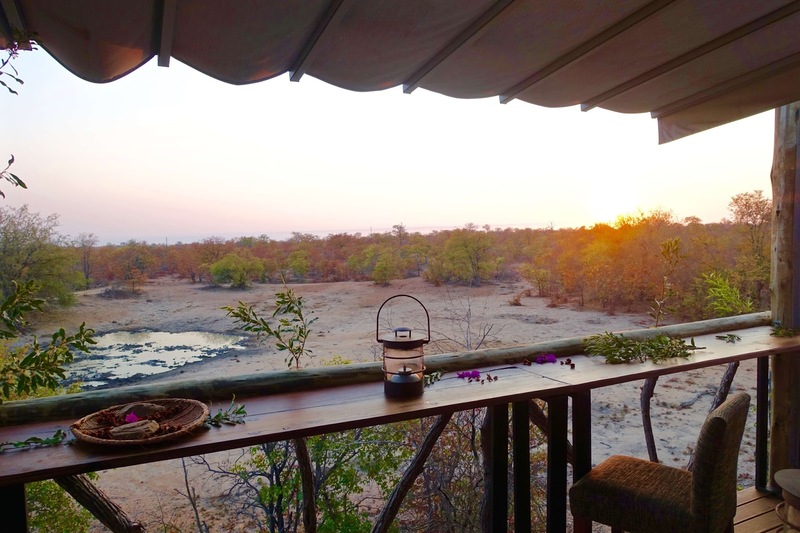 For our third stop, we delved even deeper into the South African bush to the Timbavati Private Game Reserve, which is located on the north of the Sabi Sands Private Game Reserve at the western edge of the Kruger National Park. 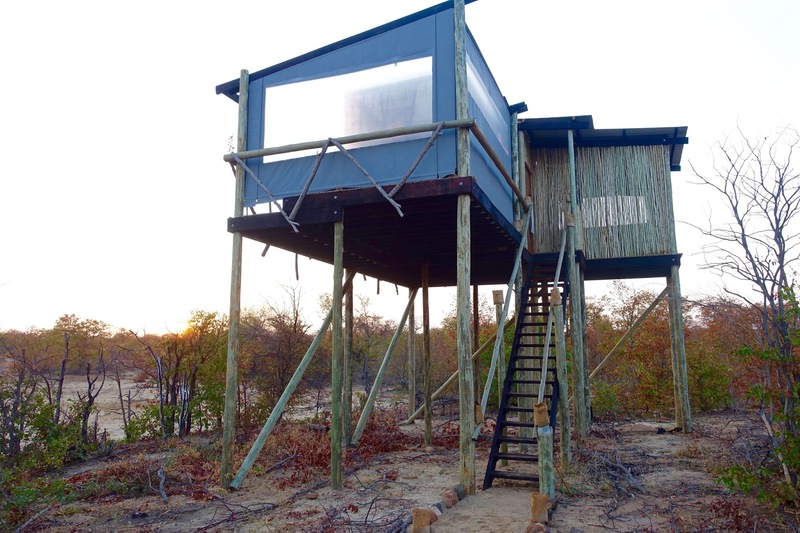 This is where we were booked in to stay for 3 nights at the luxurious four-star Motswari Private Game Reserve and for our middle night, experience the Giraffes Nest, basically a open-air treehouse in the middle of the African bush! A few months before making our trip over to South Africa ironically I was in email conversations with a Marketing & PR company called Ethos Marketing about travel, something completely unrelated to South Africa, when we stumbled onto the topic of location.. turns out their office is based just down the road from me (small world huh!). 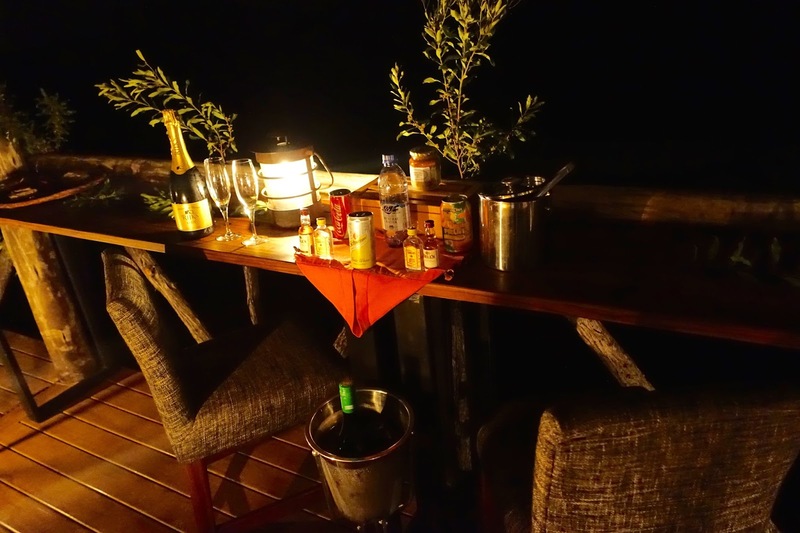 To make things even more relatable, they happened to manage the Marketing and PR for the Motswari private game lodge, which is when they introduced me to the idea of the Giraffes Nest "sleep out experience". Low and behold you can imagine we jumped at the chance and were extremely excited, intrigued and scared all at the same time, eager to know what would be in store! So whats the Giraffe Nest like? 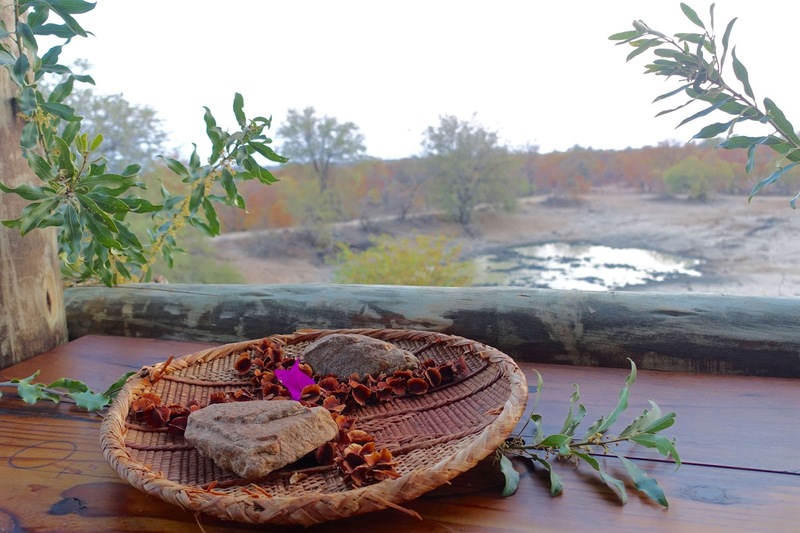 The Nest itself overlooks the Xanatsi Dam and is about a 5-10 minute drive from the main Motswari camp. (even more scary that its just you and the animals on your own for the night). 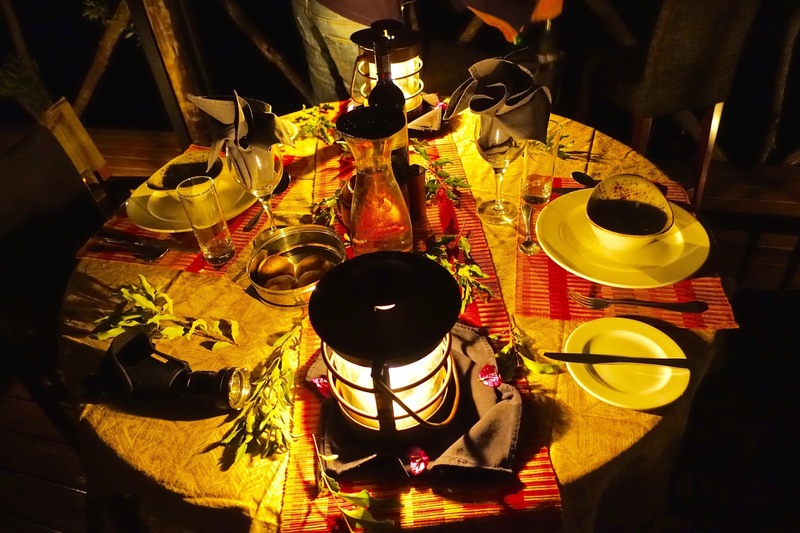 On our second night as our afternoon / evening game drive was drawing to a close around 7pm and we were making our way back to camp, we were to be dropped off at the Giraffes Nest for the night. Upon arrival we were greeted by a guide detailing the evening ahead, who showed us how to work the handheld radio (incase we needed to make contact with someone at Mostwari camp during the night) before leaving us alone to enjoy the tranquility and privacy of the night ahead. 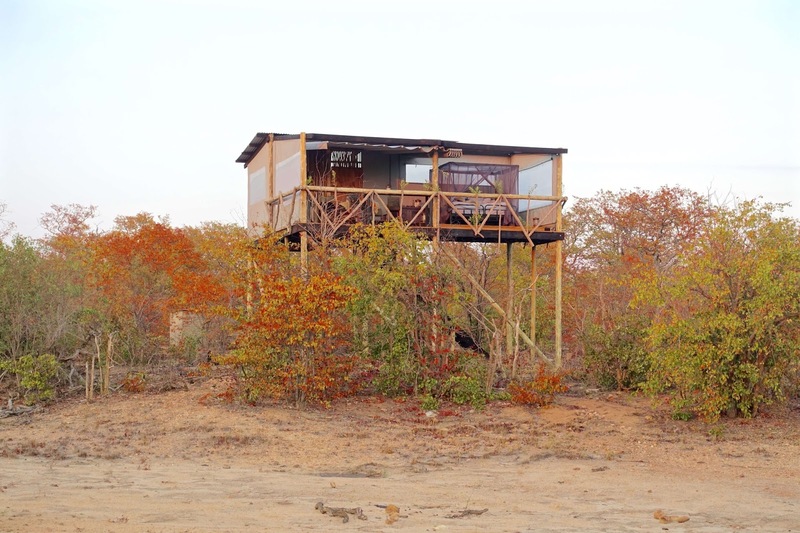 The treehouse itself is perched three meters above ground, with two locked doors leading up the stairs to the main area. 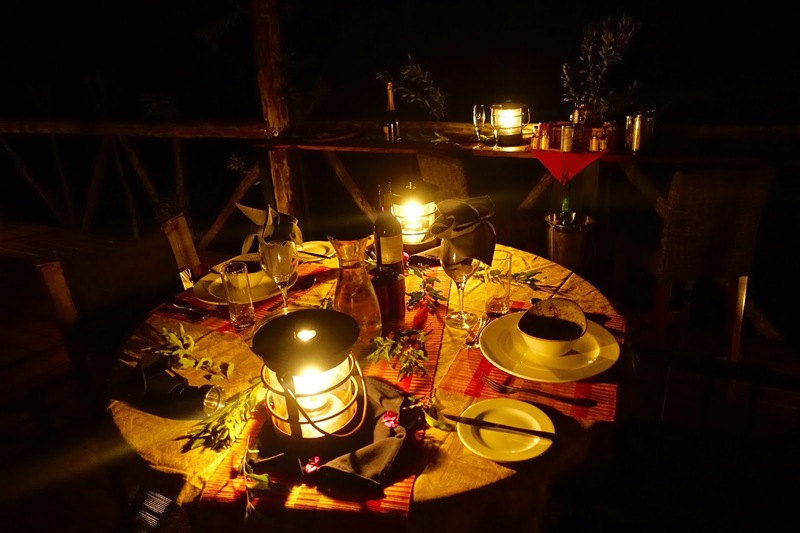 Although I did not think so at first (convinced a leopard would climb and pounce on my face in the night), we were very protected in our canopy among the trees whilst enjoying mother nature's greatest show below. We had a cooler box stocked full with our selection of drinks to see us through the evening and for our evening meal a picnic dinner was provided to enjoy. 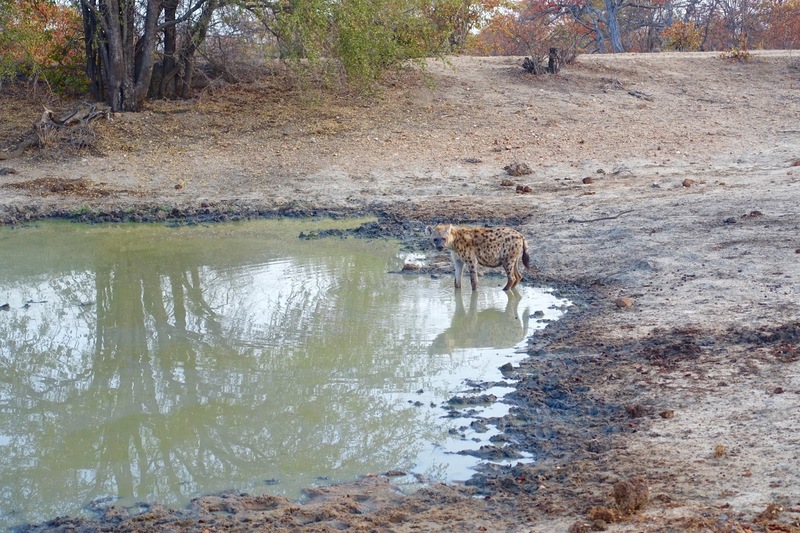 Alex pretty much drank himself to sleep that night on red wine, while I lay awake, half petrified, half exhilarated, listening to the hyenas cackling and chatting amongst themselves into the depths of the night. 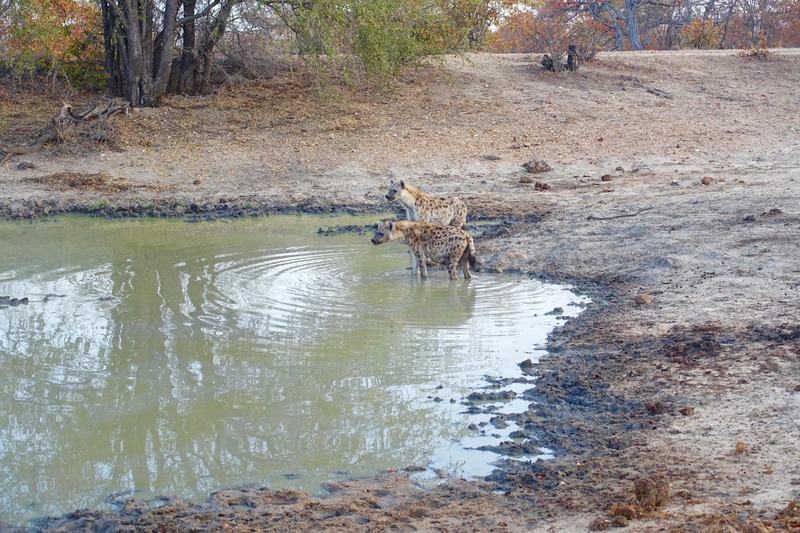 The night was filled with all sorts of animals groans, grunts and chattering.. and we did hear some noises below, using the spotlight to reveal a couple of hyenas down at the dam! What I liked most is that the Mostwari Giraffe's Nest oozes rustic charm with an authentic interior, while still offering all the comforts and indulgence of the main camp - with two wrought iron three quarter beds, crisp linen and mohair blankets, all surrounded by a large mosquito net on an elevated platform, meaning you can keep an eye on what happens at the dam from the comfort of your own bed. 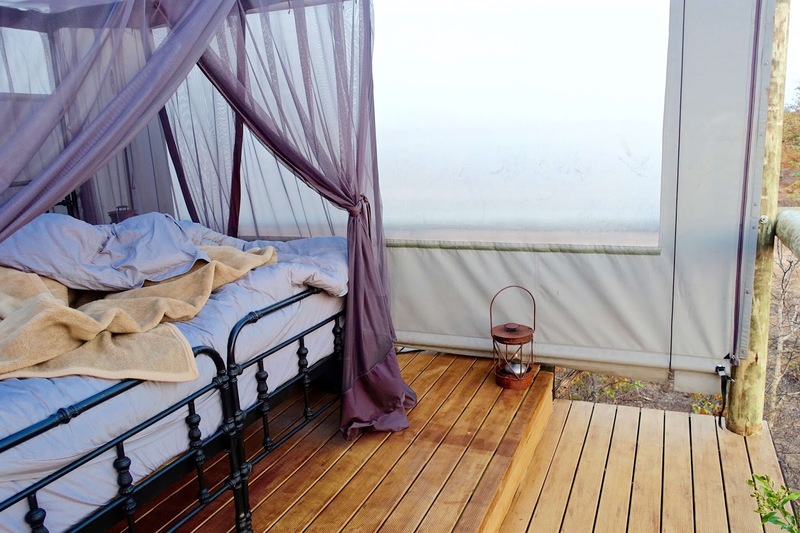 Plus to really top off our experience, and make for a romantic night, the "nest" comes complete with a retractable roof which you can leave open when you go to sleep for a night under the stars, or close over in the unfortunate event you experience rain. During our stay we were so lucky to experience a completely clear sky littered with stars and even planets - it was a truly unrivalled experience and a night I'll never forget! For all of those wondering where do you go to the toilet - don't fret, (I did at first) there is even an eco-bathroom upstairs, with a working shower (only freezing cold water I'm afraid but it sure did help wake us up in the morning), so theres no need to even leave your platform above the landscape or miss a single moment. After a night with not much sleep, but armed with lots of exciting stories to share with our guide, tracker and Alex's family, we were collected for our morning game drive at around 6.45am where we embarked on our 3.5 hour morning game drive, then returned to the Mostwari main camp in time for a scrumptious breakfast - just what I needed!